Yesterday’s post was all about learning to live with and embrace a little mess (or a lot, truthfully) in life. So I decided to show the flip side today: I can be every bit as house-proud as the next person! In this photo, my sister Chris and I show off our new room in the new house in Hastings, Minnesota. The whole house was pretty groovy, but we got to select the yellow and orange mixed shag carpet, which set the tone for the whole space. I’m not sure how we slept at night with the glow from all the yellow, but we somehow managed. And we loved it. 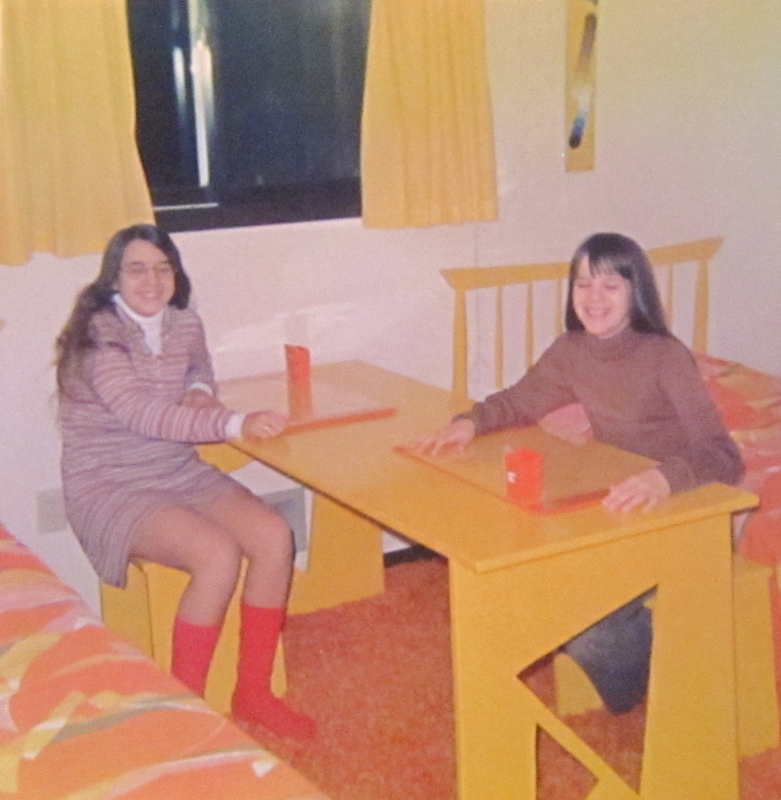 (Gwen and Annie shared a two-tone pink room with a Holly Hobby theme; Matt and Jeff shared a patriotic red, white and blue room, decorated with Jeff’s model rockets). What can I say? It was the early 1970s and we were livin’ the dream! There are these seemingly strange coincidences which happen in life. You hear about a random thing, like the artwork of Ursus Wehrli, and suddenly the name and his work are everywhere: on your cousin’s facebook page, in “Freshly Pressed” on WordPress, at Juxtapoz.com. (To see his work, go to http://www.juxtapoz.com/Current/the-art-of-clean-up-by-ursus-wehrli) Wehrli, for those who haven’t been running across him almost daily for the past week, is an artist whose work is obsessed with bringing order to what normally appears random or chaotic. I admit to looking at his work (a photograph of alphabet soup followed by a photograph of the same soup with letters arranged alphabetically, for example) with a certain amount of awe for the sheer labor-intensity of it. The compulsive nature of it. The high-magnitude need for order it reveals. The other night, I went directly from the office to an appointment, to a drive-through for a dinner salad, then back to the office for a program sponsored by my department. When I arrived home at 10:00 p.m., I popped some popcorn, kicked off my shoes, and reclined in the LaZyBoy in my living room. Looking around me, I saw the accummulated mess of several weeks of a busy schedule: on the sofa, stacks of clean laundry crammed to one end, down comforter and pillow jumbled at the other; table tops cluttered with empty soda bottles, empty microwave popcorn bags, empty take-out containers; five pairs of shoes/sandals scattered on the rug…and I briefly imagined Ursus Wehrli walking into this environment and attempting to bring order to it. For a moment, I felt embarrassment at what he would make of things. Then I mentally shrugged my shoulders and opened my 1,000 page fantasy novel. (Alan Tudyk) who played the German rehab patient, Gerhardt, in the Sandra Bullock film “28 Days”. Ok, so I type-cast in my dreams – doesn’t everyone?! Anyway, Ursus was acting as a “life consultant”, and I had hired him to help me get my life and house in order. Literally. He insisted that my calendar be arranged so that the shorter appointments occurred earlier in the day, while longer appointments followed later. Of course, every activity was considered an appointment, meaning that every activity was blocked on the calendar. Sleep, as the longest block of each day, therefore came last. No napping allowed. All belongings: clothing, beads, towels, tchotchkes were grouped together with each other, then also size- and color-coded. My house began to look like a crazed organizer or Martha-Stewart-on-steroids had been there. At first, my dream-self loved this newfound clarity. I was getting caught up on paperwork, there were no dirty dishes or laundry haunting my activities, and every night I slept in my bed (as opposed to sitting bolt upright on a chair in the living room) at a completely regulated time. But I began to think of poor Ursus Wehrli as an evil taskmaster devoted to making my life completely regimented. I became agitated, looking for a way out of this overly regulated life. Then I fell asleep in earnest, and at some point the dream segued into one in which I was stuck on an elevator and no one would help me get out. Then my alarm went off. I felt relief when I woke, looked around, and realized that the mess of my life remained unchanged from the night before. A fully lived life is messy. Not every activity can be categorized and advance-planned. If one makes it a mantra (as I have) to “choose people and doing over solitude and navel-gazing”, perfectionism drops off the list of important values. Symmetry is lovely when it occurs naturally, but when it is forced and regimented it loses its appeal. So my house is messy – in the past few weeks I’ve worked a lot, worked out a lot. I’ve talked deeply and thought deeply. I’ve travelled and I’ve relaxed. I have listened and served. I’ve been pampered. I’ve played a part in possibly saving some lives (or at least weaving a safety net for some fragile souls). Some nights I’ve slept for ten hours, others not at all. On at least one occasion, I even slept in the afternoon! Why would I choose dusting or dishwashing over all that? The people, the places, the time blocks of my life are rich and rewarding. They are also messy, crammed, thrown together in sometimes strange combinations. And I couldn’t be happier. Seriously, I would choose this chaos over well-ordered days and a clean house every time. That might disappoint my mother, and cause Ursus Wehrli to hyperventilate. But, so be it. I love my mess. Yesterday, someone compared my job to The Neverending Story. 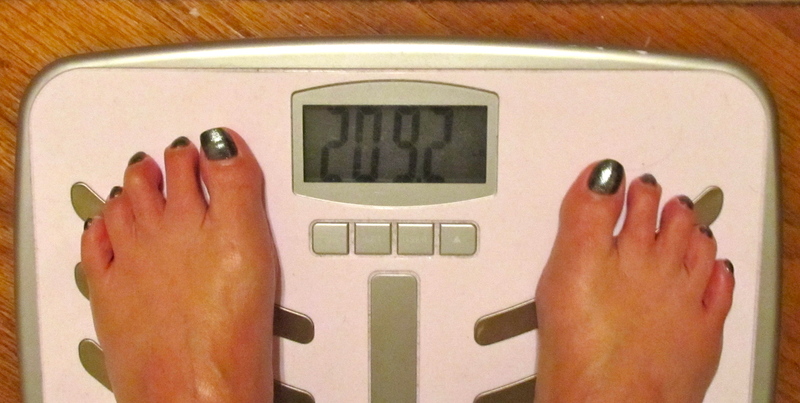 I feel like that is a much more apt description for this effort to finally get my weight below 200 pounds. For me, it has been an interesting story, though, full of plot twists, reversals, laughter and tears. All the elements of story that I enjoy. However, it is possible to take too long to tell even a good story. Last Sunday I tried a new recipe that I found here (be sure to take a look, so you can compare my results with the inspiration). It has been ages since I’ve baked bread of any kind, but this experiment reminded me why I love it. First, the most simple ingredients combine to make the most amazing food. Second, there is something about the smell of yeast bread baking in my house that just feels right (homey, inviting, tasty). Third, nothing feeds the soul like fresh bread. It is in our human DNA. A number of years ago, my friend Allan told me he had a dream about me. He was in a city, and decided to enter a local bakery/coffee shop. Low and behold, the proprietor of the shop and head baker was…me! While I have never seriously entertained the idea of myself in that kind of career, Allan said something that I have kept as an internal goal: “Your place was so warm and inviting, you were like an Earth Mother type.” OK, so those of you who know me are scratching your heads right now, because I don’t really fit the image. When I have people over for dinner, for example, I am uptight and want everything to be perfect and hardly ever enjoy the company while I’m trying to get the food finished and on the table. But that doesn’t mean I can’t aspire to it! Anyway, back to the bread. This recipe was easy, not at all time consuming (unless you count the abnormally lengthy rise-time of 10-24 hours, but that is what makes it so easy). I have not tried to figure out the nutritional value, but even though mine didn’t turn out perfect it gets a 10 of 10 for tasty. It calls for a very hot oven, and my oven cooks hot anyway, so the bottoms of my loaves were overdone before the bread was baked through. It was the perfect accompaniment to homemade soup even so. Today, I have the gift of another low-key Sunday. 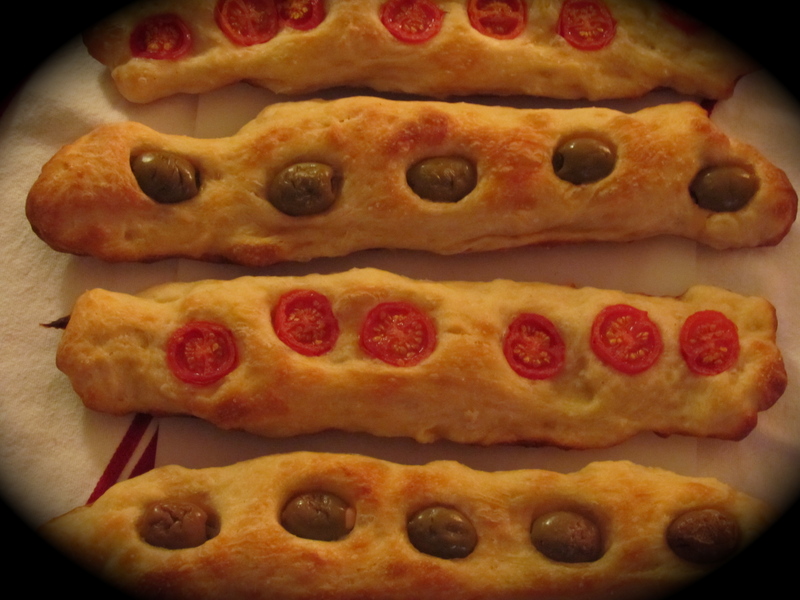 Cleaning and cooking are on my list of activities for the day – and by cooking, I mean another bread-baking day. And likely another pot of soup. I’ll be sure to let you know how it turns out! This weekend Clarke College, now University, will be celebrating Homecoming. As usual, I have no intention of attending the events. 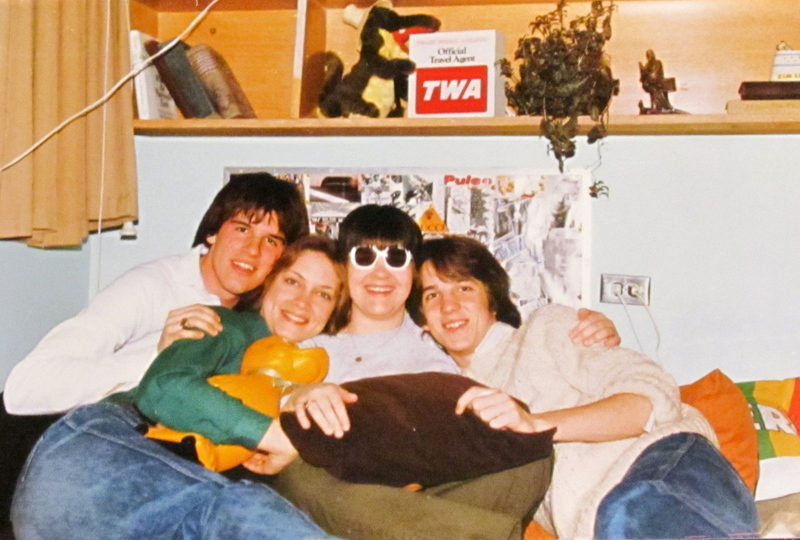 Since graduating in 1983, I’ve attended one weekend – and it was the stuff of a comedy movie. By brunch on Sunday morning, the only friend still speaking to me was Charlie, who was doing so simply because he needed someone to rehash my litany of embarrassing drunken faux pas with, and I was grateful to have someone seen interacting with me. The fact that the number of college friends I still know is small doesn’t detract from my overall positive feelings about my college experience. Clarke was the best possible fit for me, and I will remain ever grateful that I fell into it. There isn’t one person I knew there I wouldn’t be glad to see today, especially if they would talk to me! So, to all you Clarkies out there – Happy Homecoming. I remember an art teacher trying to explain the concept of perspective in drawing class. Intellectually, I got the concept, but when I put pencil to paper, I could never quite make it come out right. Those long railroad tracks disappearing into oblivion always curved in a strange way that would have derailed a train had one ever ventured down them. This week, I’ve been thinking a lot about perspective. In art, perspective allows us to see objects in three dimensions, although they are on a two-dimensional surface, in a way that looks realistic. In life, perspective is also about seeing things realistically. It can only be achieved when we allow the plane of our own understanding to intersect with that of another (or others), thereby bringing depth and dimension to our vision of the world. And richness to our experience. As an adult, it can be surprisingly easy to lose perspective though you’re not supposed to. To revert back to the kind of thinking that only considers me: my experiences, my feelings, my hurts. It is frighteningly easy to devolve into “poor me-ism”. This past weekend, I was so there. It was my on-call weekend, and things refused to go right. Saturday night/early Sunday morning, I was called to go to campus and untangle a series of events which took the entire night to sort through, and which included deeply emotional students and concerned parents, and a complex series of life events and issues. I returned home around 7 a.m., exhausted after a completely sleepless night. It was easy to say poor me. Nothing ever goes right for me. Yadda yadda yadda. Blech. And then something really sad happened. I learned of the death Sunday of a former student, one who graduated just a couple of years ago. I remember meeting Hannah, her freshman year. She was positive, bright and upbeat. She wanted to be a nurse, because she had a chronic illness and was so grateful for the amazing nurses who had cared for her throughout her life. But shortly after her arrival on campus, her condition worsened and she needed to leave school. Eventually, she became a candidate for an organ transplant, and returned to school after her surgery. It wasn’t long before another medical setback for Hannah: an opportunistic cancer, a result of the immunosuppressants she was required to take. She fought the cancer, and returned to school again. For the remainder of her college career, she participated in campus activities, majored in social work, and shared her story with many. Hannah was an extraordinary person masquerading as an ordinary college student. The notice of her death in the newspaper says, “Hannah’s life embodied her middle name, Joy, with a smile and spirit that would brighten up the room. She was sincere and caring toward all people. Her courage and drive were an inspiration to all she met. Her strong faith and love for the Lord Jesus Christ supported her through all her medical problems. Hannah will be deeply missed by her family and many friends.” All of it true. Which brings me back to perspective. So many students I work with are reckless with the lives they take for granted. Or worse, purposely try to end them. Yet Hannah fought for hers every single day – and not just to keep it, but to fill it. Many of us waste the gift of time sitting around feeling sorry for ourselves, while others find their time to be precious and short. Today, I will begin the day with a workout class at my gym, then head to work and a schedule jam-packed with meetings. At the same time, Hannah’s family and close friends will gather to share their joy in her life and their grief at her passing, Her life intersected with and impacted so many, offering depth and dimension. Perspective. It is what allows us to live life in 3D, rather than in the one monotonous dimension of self-centeredness. Today will be a good day to remember that. Remember last week, I said that I was having a hard time believing my scale? I meant it. So, in the interest of checking things out, I weighed myself on two other scales – at the Health Center on campus and at my gym. 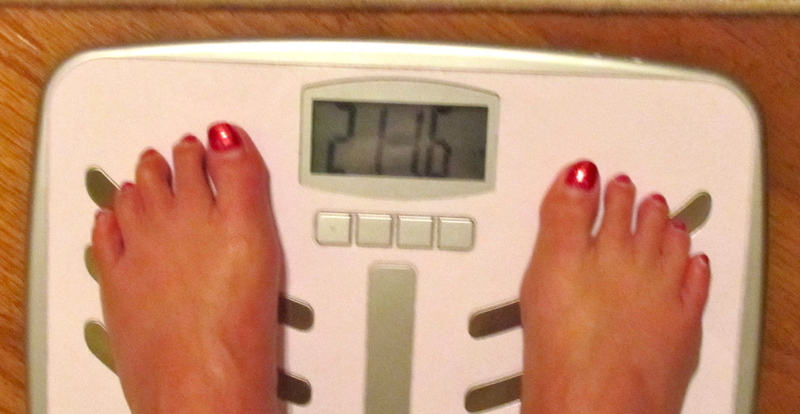 Last Thursday, both of those scales read 215 pounds. I nearly choked. But, it was clear that something was wrong with my scale at home – and even more clear that I needed to get myself in check. So, I have successfully managed to change the battery on my scale (hadn’t really occurred to me that it used one, I’d assumed it was magic). I have tested it against the other scales available to me. While they don’t all have the exact same reading, they are now within a pound of each other and I feel comfortable with today’s weigh in. Except that it is not really a weight I am proud of, representing as it does a bout of negativity and stress-related eating. I can beat myself up about it, or I can let it go and move on. So, onward and downward!